When, and by who, was this said? 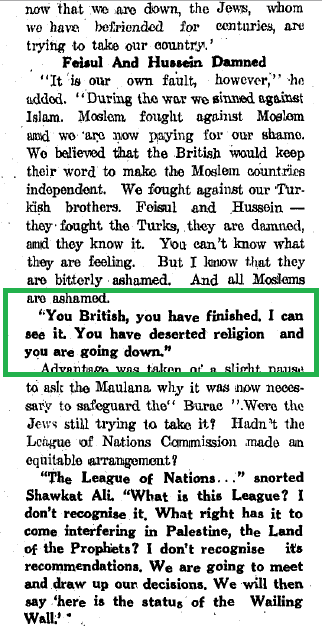 "You British, you are finished. I can see it. You have deserted religion and you are going down." 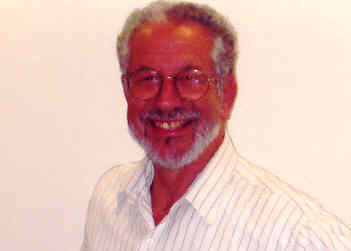 The opinion of Erik Freas, Assistant Professor of History, Borough of Manhattan Community College, City University of New York, New York City. The World Islamic Conference, held in Jerusalem in 1931 under the auspices of Hajj Amin al-Husayni and the Supreme Muslim Council, marked a turning point in the Palestinian nationalist struggle, likewise in the struggle between the two main factions—the more extremist one led by Hajj Amin and the more moderate Opposition—for control of the Palestinian leadership. The Conference, though co-sponsored by Shawkat ‘Ali and the Muslim Indian Congress, and ostensibly representative of the worldwide community of Muslims, was effectively dominated by Hajj Amin and his Palestinian supporters. Through his control of its proceedings, Hajj Amin was able to redefine the Palestinian nationalist cause as essentially a pan-Islamic one, in connection with the perceived need to defend the Muslim holy sites in Jerusalem against Zionist encroachment...the World Islamic Conference sought to redefine an issue arguably specific to Palestine as pan-Islamic one...defining the cause of the Haram al-Sharif as a pan-Islamic one also served a political objective—namely, the enhancement of Hajj Amin’s position vis-à-vis his political rivals. Shawkat ‘Ali, in elaborating his program for the restoration of the caliphate, called for the establishment of an Islamic university in Jerusalem, as in his opinion, Al-Azhar had lost its religious zeal. See Kupferschmidt, “The General Muslim Congress of 1931,” p. 130. And you thought you had read that quotation just in yesterday's newspaper, right?